Picture yourself traversing the spectacular and storied Empire Builder and Lake Shore Limited routes, all the way from Portland, Ore., to New York City, in a Budd-built short dome car, originally part of the Rio Grande Zephyr fleet, and sleeping in a roomette or double bedroom on a vintage streamlined Pullman. Now imagine having 10 days to cross the continent, and being able to stop for at least 24 hours in five cities along the way, with your cars set off the train at each locale to serve as your hotel on wheels — sort of like RVing, except by rail. Sounds like an ideal way to spend a week and a half, right? Now picture yourself making the journey I just described with a group of about 25 amazing people: enterprising and civic-minded Millennials (those born roughly between 1980 and 1995) who have each raised $5,000 through online crowd funding to make this trip, plus five Fulbright Foreign Exchange scholars from four different countries, each pursuing a project he or she is passionate about from a trans-regional perspective. Throughout the journey, all participants will be reflecting on the question: What is the new American Dream? A select group of distinguished mentors are on board as well — people who’ve built successful businesses off of innovative ideas, who’ve started social enterprises that are improving peoples’ lives, and who’ve made positive differences in other areas. These mentors lead and participate in wide-ranging discussions taking place in the dome and lounge areas. All of this fueled by meals prepared by a distinguished chef and sous chef who purchase food from farmers’ markets and local vendors in each city where the train stops, and generous helpings of beer and wine. This is the journey with a purpose that is the Millennial Trains Project (MTP). A non-profit organization founded on the notion that an exploration of the continent by train can inspire innovation, cultivate leaders, and breed world-changing ideas, Millennial Train Project is conducting its second journey starting on Wednesday. Last year’s inaugural journey took a different assemblage of Millennials from San Francisco to Washington, D.C., making five intermediate stops on the California Zephyr and Capitol Limited routes. The idea originated with founder Patrick Dowd’s time aboard the Jagriti Yatra, a month-long exploration of the Indian subcontinent by rail for young people now in its seventh year. I was one of the 24 people who crowd-funded their way onto that journey, and it was a refreshing experience that filled me with optimism for my generation’s potential to solve the economic, social, environmental, and political problems that plague our nation and world. This year, I am honored and fortunate to be chosen as Trains’ on-board correspondent for the Portland-New York journey, and I will take you along for the ride as fellow young adults — many of whom have never taken an overnight train trip, or haven’t done so in the U.S. — disconnect from cyberspace and reconnect with the American landscape as it can only be experienced from the rails. They'll connect with others, both on the train and in the cities where we stop, who are making an impact in their chosen area of focus. The five Fulbrighters — representing Indonesia, Yemen, Russia, Pakistan, and Colombia — will be on board thanks to a grant from the U.S. Department of State. Like de Toqueville, they will be exploring the American landscape from their own unique cultural perspectives. The experiences of this vanguard of Millennials may sow the seeds of a greater appreciation of the enjoyment, power and potential inherent in railroading in a key segment of America and the world’s next generation of leaders. Our journey this year will begin in Portland, Ore., where we will spend Aug. 6 and 7. We will then board our private cars, chartered from LA Rail in Los Angeles, which the Coast Starlight will take to Seattle on the evening of Aug. 7. We’ll have the morning of Friday, Aug. 8 in Seattle before being hooked up to the eastbound Builder for its early afternoon departure. We will spend Saturday, Aug. 9, in Whitefish, Mont., Millennial Train Project’s first stopover in a smaller city. 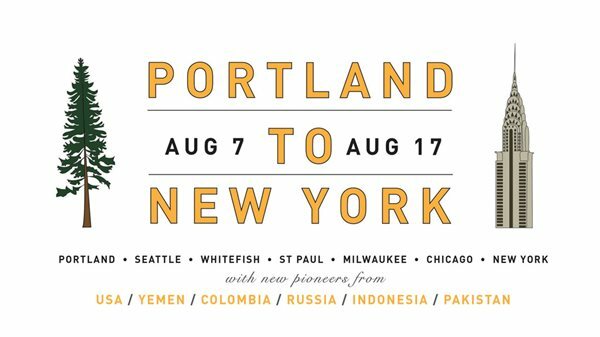 We’ll resume our eastward trek on Sunday, Aug. 10 and will arrive in Minnesota’s Twin Cities on Monday morning, Aug. 11. After a day there, we’ll continue to Milwaukee on Aug. 12, staying in Brew City through Thursday, Aug. 14. That morning, a Hiawatha train will take us to Chicago, where we’ll spend the rest of the day. Friday, Aug. 15, we’ll travel behind the Lake Shore Limited to New York, where the journey will conclude with two days in the Big Apple. In each city, participants will pursue their projects by meeting with movers and shakers in those communities and taking time to explore. A coffee shop or co-working space in each locale will serve as a hub where participants may converse and get work done on their laptops. There will also be group activities programmed by the train’s eminent mentors. Each day concludes with an hour-long guided session that gives participants an opportunity to reflect on their day, share what they learned, and attend to the development of their own professional and leadership qualities. Finally, each person summarizes what they did that day over dinner. One exciting new element of this year’s journey: a section of the lounge of 1956 dome-lounge Silver Splendor will be converted into the first ever mobile maker space, outfitted with a 3D printer and other tools. More about that in a future post. Last year’s cohort came away from the journey not only energized to continue pursuing their difference-making passions and having made many new friends, but also with a greater appreciation for the singular value that train travel brings compared to other forms of mobility. No car, bus or plane can as readily serve as a traveling coffee shop, collaboration space, restaurant, bar, lounge and hotel like three railcars can. And the mountains, forests, rivers, plains and deserts, towns and cities that make up America can be seen in an intimate manner that is only otherwise possible on foot or on a bicycle. Train travel gives one the time and space to experience the country as it is, while pondering ways to revitalize it. Anyone who foresees and wants to bring about a bright future for passenger trains in America — and long-distance trains in particular — should celebrate and promote concepts like the Millennial Trains Project. Long-distance trains already serve a multiplicity of travel needs in one highly productive vehicle, and provide an important travel choice, especially to residents of smaller towns and rural areas. But they can also be ideal vehicles for travel with an educational or social purpose, as well as ecotourism and voluntourism. If more organizations and companies could follow Millennial Trains Project’s example and come to see group travel by train as a conduit for team-building and idea cultivation, then there would be a broader base of economic and political support to achieve the expanded coast-to-coast network of passenger trains that our nation deserves. I hope you’ll join me for this exciting, seminal journey over the next two weeks, as the rails guide us towards redefining the American Dream for the next generation. I will write regular dispatches from the train that will appear here on Train of Thought. I will also share observations and photos via the social media channels of both Trains and MTP (@millennialtrain on Twitter and Instagram). My next dispatch will introduce you to some of my fellow Millennial travelers. 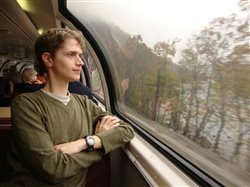 Malcolm Kenton is a 29-year-old writer, researcher, multimedia communications professional and photo/videographer, and a seasoned passenger train traveler and advocate. He grew up along the Southern Railway (now Norfolk Southern) main line in Greensboro, N.C., where he received his bachelor of arts in Political Science and Environmental Studies from Guilford College in 2008. He now resides in Washington, D.C., and is pursuing an master's of administration in Transportation Policy at George Mason University.